QStart Labs is the first technology company that actually aligns their interest to us as investors. Because of our roots in the VC world, we built our model to reduce the typical cost, risk, and speed challenges that prevent otherwise great ideas from achieving spectacular exits. We Know Your Frustrations…We’ve Been There Too! You’re seriously invested in the companies you work with. You have a vested interest in seeing them succeed, after all your bottom line depends on theirs. You’re tired of constantly recreating the digital wheel. And expensive marketing, design, and digital consultancies don’t guarantee anything other than collecting check—and that intensely irks you. Yeah, us too. In fact, QStart Labs was started by VC’s and entrepreneurs to help investors do one, simple, beautiful thing: increase shareholder value. Because of our roots in the VC world, we know the technology pitfalls that can trap startups and investors. We know investors lose sleep over technology investments. And that’s why we know how to reduce typical cost, risk, and speed-to-market challenges. Why QStart Labs For Investment Groups? Whether you are an Angel Group, VC, or other investment group, the goal is the elusive successful exit. We understand the impact that getting to market quickly, preserving cash, and reducing your risk can have on your returns. QStart Labs was built by entrepreneurs and investors to meet investors unique needs, integrate with your processes, and leverage our unique business model that ensures alignment with your portfolio company’s success. We have been the digital agency route and know that their model does not work for startups. From the start, we built QStart Labs to ensure aligned interest with launching, growing, and getting startups to exits. So talk to us. We’ve been where you are. We know what you’re up against. Hold on to your hats folks! You’ve heard that we are part entrepreneur, part investor, and all partner, but our model is how we prove it! We take no equity, have covered the technology/IP challenges that typically cloud exits, and contractually bind ourselves to many other crazy things to give you the best chance of success. Our team is lean, smart, experienced, and crazy talented. Did we say experienced? Patents. Awards. Great stories and great reputations. People name-drop us on occasion. While we’re not much on bragging, if you Google us, you’ll see that we’re not just legit but we’ve been around every digital block since the dawn of the digital age. We’ve been there, done that, and have the T-shirt! Not only have we launched over 45 startups since 2008 but our companies have raised over $25 million from investors. Did we forget to mention that 2 of our companies have exited already and a few more in the works? Don’t take our word for it, see what others are saying about us. Our Model: Alignment = Successful Outcomes! When was the last time your technology partner’s success depended on your portfolio companies’ success? Do they really care or just look forward to “sending the invoice”? The dirty secret is that they win regardless of their client’s success. I guess it was all about them the whole time! We all know there are thousands of web development companies that “win” while investors spend millions of shareholder’s dollars on failed technology efforts. We have watched this play out all too often and decided to do something about it. We focused on what a relationship would look like if there was a technology development / startup advisory firm that was aligned with their client’s interest and then we built our model around that. What does that mean? We only succeed if your portfolio company succeeds! We built our model to ensure we are as invested in your portfolio company’s success as you are. We take no equity, have covered the technology/IP challenges that typically cloud exits, and contractually bind ourselves to be there helping you until the end. We only succeed when your company succeeds! We work with your portfolio company build the right thing to get new ideas to market or continue growth at each phase of the business. We want more of the “use of proceeds” from you investment to be used for business growth so we perform all work AT OUR COST! Aren’t aligned interest great? Equity does not create the right incentives to ensure developers and advisors are aligned with your portfolio company’s success. Revenue sharing is an easy way to reward the investment QStart Labs is making in your company and ensure that we are aligned with their success. Alignment means that we want to waste no time/money building things that do not help drive revenue. Great ideas need to get to market quickly! Once we have identified the right functionality for launch or growth phase We contractually bind ourselves to deliver all functionality to our test servers within 3 months, regardless of complexity or scope, and no, we are not talking disposable prototypes here! Why Would QStart Do This? We are as passionate about building successful web businesses and not “just building technology” because we can. We believe the best way to ensure startups have the best chance of success is to have a partner that is aligned with their interests. Been There, Done That, And Have The T-Shirt! Don't take our word for it, see what our clients say! "QStart's process is huge, and by huge I mean they have figured out how to be accommodating, but also directional. Their capabilities span multiple dimensions of the digital world and they helped mold those to the dimensions of our organization. Their flexibility had even more impact than their process did as we explored the possibilities of what we were creating, not to mention their team's depth of capabilities (especially Ben Wallace who we had direct interaction with). My recommendation to any organization starting to work with them: Simply tell Qstart the problem(s) you are trying to solve and they will connect the solution." Experience: The QStart team had decades of managerial, entrepreneurial and tech experience that other tech firms could not match. Expertise: Their "Rock Star" team of experienced developers did not need to be educated about the perceived challenges of the trucking industry.The "been there, done that" knowledge base was crucial to easily integrating complex US tax law into a mobile solution. Integrity: The unique QStart business model aligns their interest with those of their client firms and they have on numerous occasions gone beyond their contractual duties to insure Per Diem Plus exceeds the expectations of our truck driver customers. Reputation: Reputations are earned over time and cannot be bought through today's modern social media world. Due diligence with respected members of the investment community confirmed what one meeting with the QStart team revealed: QStart's solid reputation is based on their experience, expertise and integrity. "QStart Labs is the latest addition to our member recommended provider program because of their unique focus on helping investors and their portfolio companies succeed." "QStart Labs is playing a key role in assisting Greif's expansion into new lines of business through the use of technology. Their approach has allowed us to quickly bring value to our customers while laying out a technology roadmap aligned with our long-term objectives." "The fast paced success we are experiencing is due to their strong strategic planning, detailed work processes, and pragmatic approach to technology development. We are pleased to have such an experienced team of professionals to help us take Grief to our next phase of growth. Great Job QStart Labs team!" "QStart Labs enabled DOmedia to quickly assess market opportunities, build customer-centric technology and adjust to market demands within the first year of commercialization. QStart continues to be a valued, strategic partner in helping DOmedia to build its suite of products for the Out-of-Home media marketplace." "We wanted to create a more efficient way for pet owners to shop for pet health insurance. QStart played an integral role in building the technology that allows dog and cat owners to get custom pet insurance quotes in real-time. No other website has this capability because integrating one system with several different companies is an extremely complex and time consuming endeavor." "QStart has the people and resources available to make complex system integration possible. They've been a great partner for us and a truly fun group to work with." 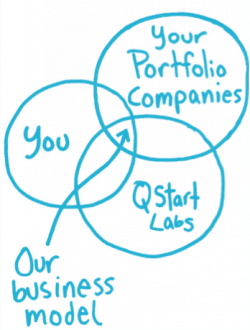 "What makes QStart Labs so great is the amazing team they have put together. Their team brings so much knowledge and expertise in areas of business beyond just technology. Having access to a trusted source like this within one company is extremely rare and valuable to new businesses." "I am confident that I make the right choice in partnering with QStart Labs to grow my business. Thanks QStart Labs!" "There isn't enough room to express how great it was to work with the Qstart team in the development of our MVP, so I will summarize. When approached with the idea of developing our MVP in 24 hours I thought these guys must be good or just crazy. It turns out they are better than good - they are great." "From the campfire that went so smooth I think even the Qstart team was a little excited, to the development of the MVP which was done 24 hours after the campfire as promised. The project was perfect!" "You don't often come across development firms that really grasp the business and domain needs of their clients. QStart not only focused on our business problems, but were able to provide us with high quality and technically sound results under tight deadlines." "Kevin and his team have never failed to go above and beyond their contracted duties to assist us in any way we have asked-and several times without being asked. Being a Tech Startup can be very trying, to say the least. Having a "partner" that is willing to leverage their experience and bring real world knowledge and enthusiasm to every meeting is rare. QStart has been that company for us, and we are very grateful. I would (and always do) highly recommend them!" "Qstart Labs has maintained an exclusive relationship with Seamless Logistics for all of our technology needs. They have been exceptional to work with and have taken the normal expected frustrations when dealing with technology development out of the equation for us. Qstart Labs, and its team, have a proven system for web development." "Their customer service and professionalism have made them a joy to work with and I would highly recommend their services to any company looking to streamline their technology process to better enhance their business." "They definitely are professionals and experts in their field, allowing us to be professionals and experts in ours! Not only does our new website look great and boost our image, it is also highly functional and boosts our organization's productivity." "QStart Labs is the first technology company that actually aligns their interest to us as investors. Their business model allows NCT to increase speed-to-market and enhance our ROI." "We particularly like that QStart Labs is incentivized to help make our portfolio companies successful, and that we incur costs only when development is needed vs. internal overhead." "As a small and growing IT company, we are always at risk of making wrong decisions and turning into a path that might not be best for our long term vision and goals. Jeff and Kevin from QStart Labs went through the strategic planning session with us, and opened our eyes to a great methodology that will surely help us through our journey into success." "I really recommend this session to any start ups and small/medium businesses to help steer the team into ONE direction, to help identify and reach their short and long term goals collectively." "With Qstart Labs, you're getting an experienced and highly skilled Internet development team, whose main focus is creating an application that's "revenue ready" from Day One." "Azoti chose Qstart Labs specifically due to their experience building online marketplaces and eCommerce solutions as well as their start up business model that allows us to scale costs as we grow." "The QStart Team has been a pleasure to work with as we at PackH2O have launched our web site and our commerce program. They have met all deadlines and have kept us abreast of all activities related to the launch on a daily basis. Great Team! I would highly recommend." "QStart Labs delivered incredible value in a condensed period of time through their campfire process. It was amazing how quickly they grasped what we were trying to do and the depth of knowledge and experience that they were able to bring to the process." "They challenged us, made us think in new and different ways, and delivered well above our already high expectations. Anyone considering any kind of web development project should first go through their campfire process." "As a start up company with a significant requirement for not only a strong development team, but also a business partner, we couldn't ask for more than our exceptional relationship with QStart Labs." "The QStart Labs team have been willing to help us every step of the way, building trust, respect, and ultimately a long term partnership that we believe in. I urge anyone who has development needs, or those who simply want another viewpoint on their product in leveraging QStart Labs' campfire process, to at least spend some time talking with them. Certainly worth your time." "Recently at a big cross agency dinner in NYC and our PR lead turned to a QStart Labs team member and asked: 'how long have you worked at TruYuu?' This about sums up TruYuu and QStart's relationship." "QStart truly understands our business and is an indispensable part of our team. We would recommend them to any young companies trying to get up and running." "Our partnership with QStart Labs has allowed Mediplay to focus solely on growing our national network, without the need for an in-house development team. The work involved in putting together our online portal went far beyond the scope of a normal web interface. Their team of dedicated professionals took the time to understand the logistics of our third-party application and created a robust, user friendly interface that has scaled seamlessly with our business. We were drawn to QStart by their innovative business model and “hooked” after meeting their team. Over the years, QStart’s has proven time and time again that we made the right decision." "The QStart Labs team has been instrumental in the development and implementation of our online application. They completed our project well ahead of schedule which was key to our company achieving important strategic objectives." "The professionalism, expertise and dedication they demonstrated are something to be admired and we highly recommend QStart Labs for any online design and development initiative that is critical or otherwise for your going concern." "We at Embrace were fortunate enough to be a growing company in a growing industry and needed to make sure that we did not outgrow our technology." "QStart helped us prepare for not only the present but the future growth that we expect and made us comfortable to grow our business with no restrictions. The partnership with QStart was like no other and we truly felt like they were part of our team. "The one thing that really impressed me was the way your team made me feel not just like a customer but like a partner in the project. I felt like the QStart team cared not just about the specific job that we were working on and getting paid, but about my company and its overall goals." "I'd like to thank the QStart team for working hard, making yourselves available, and delivering a very nice website even in the seemingly impossible time-frame that you were given to work with. Many great sales leads were generated from it! You guys have a great thing going, and with the experience that you and your team bring to the table, I feel I am in very good hands for our future projects!" "Jeff and his organization [while at Interactive Ink] have proved to be an invaluable asset to our web project. Jeff and his staff are head and shoulders above previous companies hired to help produce our website. Jeff is exceedingly well versed in all areas of marketing technologies and brings innovative solutions and suggestions to our project." "The team at Qstart Labs was instrumental in helping TechColumbus document technical requirements for the redevelopment of our website." "Kevin, Kipp and Jeff's expertise helped create a clear vision for the developer who will take on the project, and as a result I expect the process to run much smoother than if we had attempted the task on our own." "The Campfire process was very helpful and gave us the ability to visualize our program and its functionality. We can see the possibilities. The QStart Labs team was highly responsive, very professional and the process was very effective." "I wanted to thank the QStart Labs team for the excellent, insightful and thought provoking campfire planning meeting. Although this is the third company I have started, your process of flow charting, white-boarding, and astute probing for positives and negatives that plague start ups was most impressive. I cannot recommend you company, expertise and spirit of cooperation highly enough." "The campfire fee was more than worthwhile when compared to the knowledge I gained from the process. Although there are many development companies out there to choose from, none have demonstrated QStart Labs' expertise and knowledge of the challenges that we start ups face." "What an extraordinary surprise to find QStart Labs was just as interested in my success as I was in succeeding. The campfire meeting actually gave us a jump start by helping improve our business model. The willingness of your management team to share their diverse, in-depth business knowledge was nothing short of phenomenal." Are You Really Going To Let This Pass You By?